HELP steem! "Get Steem on Netcoins and Earn Free Partiko Points". As we all know there are only 30 mins left to come the results of the contest. As we all know Steem was on the top of list few hours ago but currently Steem is on 2nd place. The INS is leading the list with 21397 votes. Steem is lagging only 1k votes to be back on #1 rank. 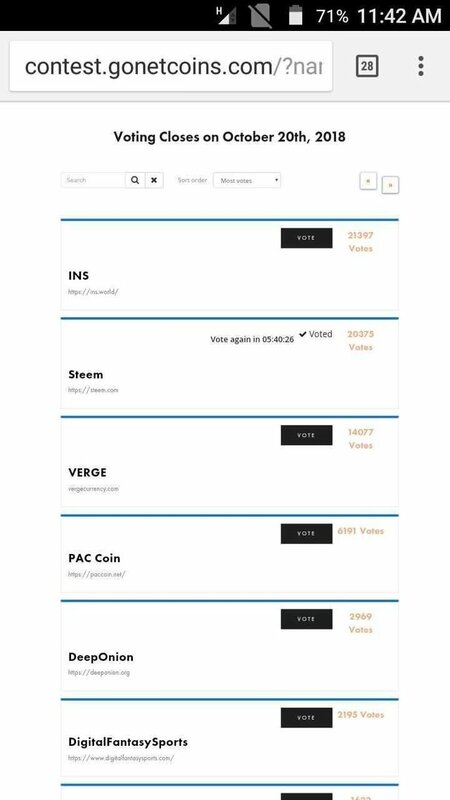 So guys put your hands towards the vote to steem. SteemIt has nearly 1.2 M users but out of those users only 20K users have cast their vote in favour of Steem. These users really care about Steem others are not interesting in it. Guys we only need 1K votes to be back on #1 rank so guys VOTE FOR STEEM. Search for Steem of Scroll down. Enter your E-mail and click on "Vote". Then click on Send Confirmation Code. Go to your E-mail and confirm your vote. You have successfully casted your vote in favour of Steem. Guys there are only few minutes left and we are lagging only 1K votes. You guys can use different e-mails with different browsers or VPN to cast your vote. Hurry up time is running up. I hope we will be back on #1 ranking. NOTE: If you guys have casted your vote, then resteem this post so that everyone will see this and cast their vote. If you haven't claimed your DIGITEX FUTURES airdrop, Click here to claim.